Community buses are all wheelchair accessible. Drivers may deviate from the established route and will make every effort to be accommodating. Community Routes buses run from 6:45 am to 11:30 pm, Monday through Friday, weather permitting. Closed on Thanksgiving Day, Christmas Eve and Christmas Day, New Years Day. In the event of bad road conditions, Community Routes may end early, start late or not travel certain roads. Please contact the dispatcher if weather conditions are uncertain. For complete details, please contact the dispatch office at 866-388-6071 (toll free) or 828-359-6300. Text 828-269-5790. 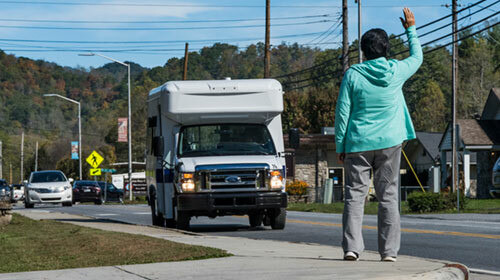 Mobility Division provides service for Medical appointments in Cherokee and nearby towns, and transportation to the dialysis center for patients. For details and eligibility requirements, call 828-359-6304 or 828-359-6305. Medical transportation is available for Snowbird residents. Call 828-346-6981 or 828-346-6743. Email your needs to kevitafo@nc-cherokee.com and we will respond by email. Or contact us by Facebook Messenger. Phone 828-359-6300. or 866-388-6071 (toll free) to arrange for a pickup on either a one-time basis or a regular schedule. Text 828-269-5790. Wave — While Community Routes buses are on a general schedule, with designated stops, drivers have the discretion to take on and let off passengers as requested. If you need a ride and see a Community Routes bus, get the driver’s attention and he or she will give you a ride. The Community Routes service area is divided into zones to determine fares. The minimum adult fare for Community Routes is $1.00. There is an additional charge of $1.00 for each additional zone reached, whether the rider’s whole trip involves one Community Routes bus or more than one bus. Additional charges also apply when transferring from Community Routes to other Cherokee routes. Upon boarding, please tell the driver your final destination and pay the entire fare for your journey. Monthly and weekly passes are available – $80 for unlimited monthly rides and $20 for unlimited weekly rides.